With Winter upon us, children have to adapt to indoor entertainment. After reading books, watching TV or playing the Xbox, children become bored very easily. So what to do? If your child is tiny then they can be amused with coloring books, toys or just a cuddle by the fireside. But if your child is old enough to want something more stimulating to do, then why not introduce them to DIY? Obviously I don’t expect a five year old to get up a ladder and fix a leaking roof! Or maybe even clamber under the sink to empty a blocked drain! Oh no! I mean simple things that will put him or her in good stead for when they grow up. All children watch their parents doing things around the house, so why not get them involved? If you think about it for just a moment, how many small jobs never get done because you are either to busy looking after the children or you have so many things to do, they get forgotten? By combining the DIY with your children, you will make learning fun and give them a skill that they can take with them into adult life. The first thing that you should do before you start, is to go out and buy a couple of pairs of overalls for you and your child, or if you would rather not spend money, pick out old clothes that you can use again and again for your DIY. Collect lots of newspapers, magazines and old blankets to put on your floor, and to cover the furniture. We don't want any mishaps! 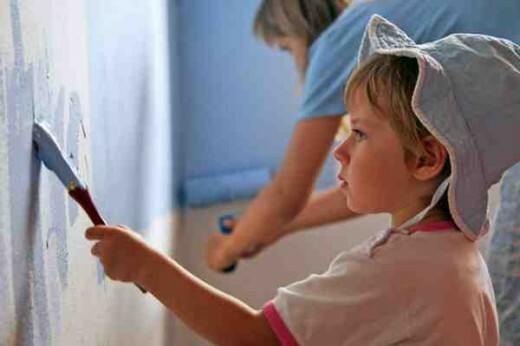 Children love to paint, so a good way to start is to make it a fun day out going to buy the paint. Ask your child what his or her favorite color is, anything goes as long as its not black or grey! That would be too dismal. Most children like yellow, red, orange, and blue. All the bright colors that catch their attention. Once they have picked out their favorite, making sure that the colors are not to garish or don't match, then head for the paint brushes. By the time you get home your child will be raring to go. When you start painting, make sure the child is in a well ventilated spot. Some people do not take to the smell of paint, and we don't want any bad tummy's or sickness caused by the smell or chemicals in the paint. Try to make it a water based paint, this usually dries well and leaves little or no after smell. Give them a corner of the room to start with, and make it fun with plenty of dancing and singing along to their favorite tunes. If you get a few splashes here and there, well, who cares? A good point is to guide the child without them realising that they are actually being taught. Make it fun, but at the same time, show them how you do the brush strokes, so that they can follow in the same way. Great fun! If you feel a bit more adventurous, why not buy a few stencils and make the bedroom into a magical wonderland? Flying horses, fairies and trees and so much more. 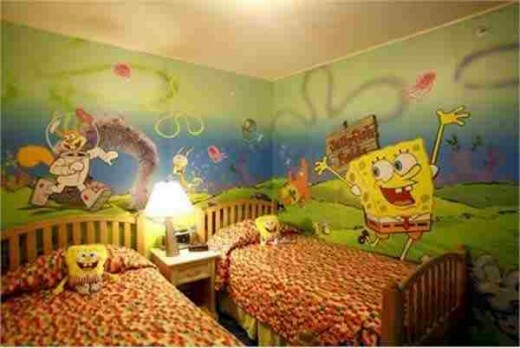 You never know, your child may love it so much that they will go on to be an interior designer! Every child's bedroom, however clean and tidy will always have toys, or bits of toys laying around on the floor or window ledge. Even if they have a toy box, you can guarantee that they will have filled it up so that the top layer of toys falls on the floor every time you move around. So making a Toy Box is a great idea. All you need is a large cardboard box. Most of us have at least one of these hanging around somewhere in the house. If you haven't then every store will have loads at the back of their shop. Just ask if you can take one, they will be happy to oblige. When you have the box, lay it on the floor, and cut it into the shape that you want. Then get some wrapping paper, plain or even Christmas paper will do, especially ones made for children, and get your children to cut the paper, and glue it on one side so that it will fit around the box. They can also make stars, or flowers out of the cut offs, and stick them to the sides of the box too. Adding wooden letters, or ABC plastic ones that they no longer play with, is a good idea too. In fact anything and everything can be added as long as your child is enjoying themselves! Of course, if your child is a little bit older, you can make a wooden box, using the proper tools, but obviously only under strict supervision. As an idea to get them started, you can buy smooth wood, child hammers and tools, in a range of colors, especially made for children to learn woodwork. Its only when Winter arrives do we realise exactly where the gaps and gaping holes have appeared over the summer. The wind whistles through, and the icy blast wraps around your ankles. So a good idea is to buy some filler to bridge those gaps. Buy a scraper or use an old blunt knife, and get your child involved in the filling. Make it fun, most of the fillers are quite thick, so after applying the mixture to the hole, they can make a face or pattern in it. Leave it alone however much of a mess they make! After they go to bed exhausted from 'helping mommy' you can then sand down the plaster until it fits properly into the gap. However much we try to keep warm in the Winter, there always seems to be a draught coming from under the doors. 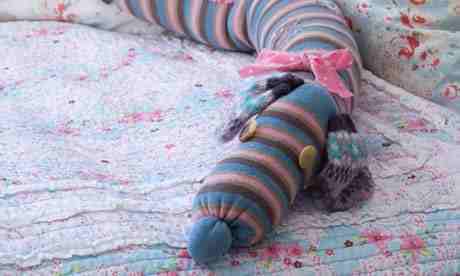 Why not make a fun draught excluder? Not only will it look great, it will keep your feet toasty too! Take your child to buy the material. Let them feel the cotton or silk to get an idea of the type they like. You will be surprised at how soon they will show a preference. Either buy the needles and cotton that you need, or if your child wants to make the whole excluder, you can buy material glue that will do the job just as well. Sit on the floor, and spread out the cloth, and under supervision let your child cut the cloth with child scissors, if its to difficult, let them hold the cloth while you are doing it. Then let them loose with the glue, and while that's drying, give them loads of old clothes, cotton stuffing, and other things that can be used to fill up the draft excluder. A good idea is to collect the small polystyrene beads that you find in packing, or bubble wrap. Your child will have a great time jumping in the beads or seeing how many bubbles they can pop! When the glue is dry, they can then stuff the excluder and stick big eyes on it to make a snake, or even ears to turn it into a dog. Make sure that you have lots of felt for them to use. Sanding Down A Table Or Cabinet And Then Painting It. Children love making a mess. That's a fact. So if you have a small table or cabinet that's in real need of restoration, why not let your child have a go? All you need is some sandpaper, rags, and the color paint of their choice. Before you start, make sure there is enough clean air coming into the room. There's nothing worse than dust flying about. So, if you have a garage or shed that is reasonably warm, then its probably better to do it there. If your child is Asthmatic, never let him or her sand down the table. It can start an asthma attack, just let them watch, helping out by painting the drawers or putting the paint in jars, ready for painting. Even if your child is fine, try and get them to wear a cloth mask, or even a toy mask to stop the dust getting down their throat. Even this can be fun, they can dress up as a bandit or pirate! Then let them loose with the sandpaper! They will love scrubbing away all the old paint, especially if they can make a mess. Then when they have finished they can paint it. Just imagine their little faces when it looks brand new! These are just a few ideas that will help your child become independant in the future. Incorporating DIY into their play, they will see these chores and necessary jobs as something to be enjoyed and not dreaded as they get older. And of course the earlier they learn, the easier it will be to do when they get married and have a family of their own. A lot of people leave things undone in their house purely because they don't know how to start the job, or have no idea what tools and equipment to use. By teaching the children DIY in early life, they will learn to respect their homes and be able to spot any problems before they get out of hand. And hopefully they will go on to teach their own children too. After the initial euphoria of finding out that you are pregnant, your mind turns to more practical things such as expense! What with the baby cribs, nappies, baby grows and so on, you suddenly realise that you have to buy one of the most important..
Keep your children safe with these latest Child Locator tracking devices. From toys to watches. I've always been a do-it-yourselfer with all kinds of projects to do, so my kids all had to "help". What a mess that can turn out to be, but they loved learning how to do things. Great Hub. I voted it up, shared, will Pin and tweet. What a great idea... you are right about involving them in activities like this- they enjoy it and it also sets the tone for future help... our kids got together and drew up a household chores rota between them. I was amazed. of course they need reminding once in a while but love the fact they took responsibility. 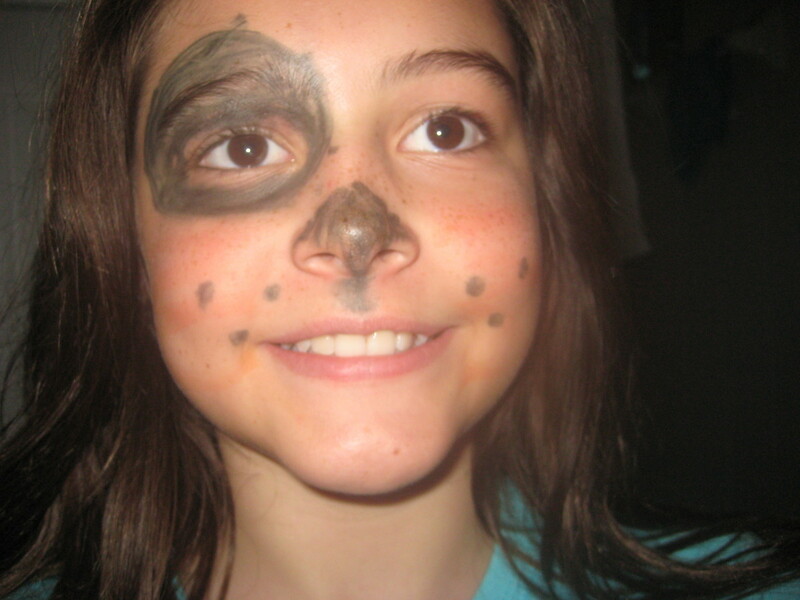 Loved all your ideas here Nell on DIY with your children and making it fun, especially painting their room. I can very much seem my older daughter down the road enjoying doing something like this, because she loves drawing and being creative even at this young age. Thanks for sharing and have of course shared, voted, tweeted!! Hi, HawaiiHeart, thanks so much for reading, it was fun! lol! Thanks so much alocsin, I remember doing this with my son, and he always got covered in paint, but he loved it! lol! and yes it was non toxic, in fact not only for him but I am allergic to the smell of paint, especially gloss! lol! Such great ideas! Painting sounds like a lot of fun! What a great idea and kids would love to help mom and dad make stuff. I think starting with a painting project is an excellent suggestions since it can't hurt anybody if something goes wrong, especially if you use non-toxic paints. Voting this Up and Useful. SHARED. Hi, tara, thank you so much! I remember doing all these things with my son when he was small, now I am doing them myself as he has moved out! lol! Nell Rose - Thank you for your hub. I have posted this on my favorite hubs of week: Jan 29, 2012. 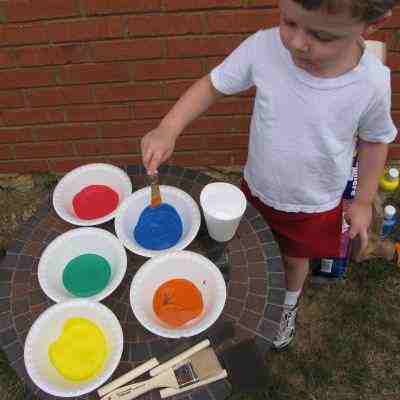 Great ideas for DIY projects with kids. Voted up. Hi, Jlava, thank you so much, its just different ideas that pop into my head during the day, usually when I am doing something, like in this case, babysitting! ha ha! 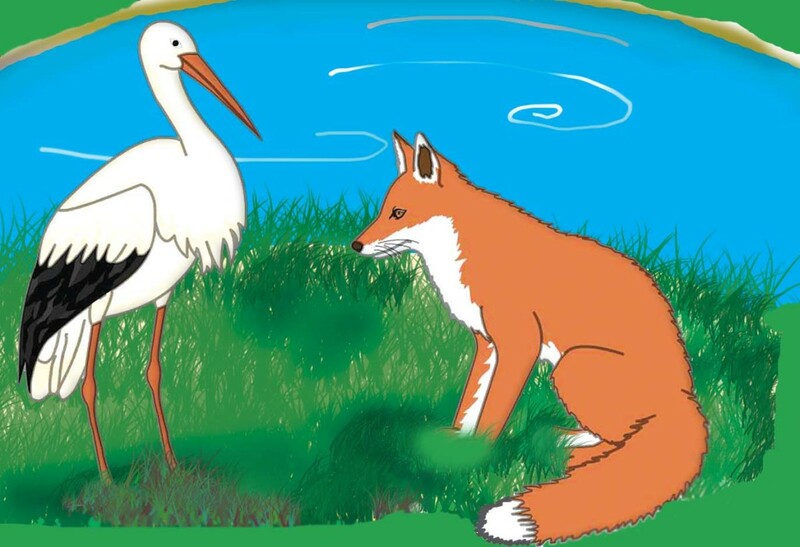 Hi, Fiddleman thanks so much, that's a shame that you weren't allowed to do it as a child, I learned from my mum and she always let me loose with the paints! lol! it doesn't always lead to a job or a good skill but it was fun. Great ideas here Nell Rose, wish someone had taken the time to do this with me when I was a child. Hi, tammy, thanks for reading, my son always liked getting out the paint brush, so in the end I let him do his room, with a bit of help too! lol! glad you liked it, and thanks! These are great ideas. This idea really works to. My children helped me with all my projects as they were growing up. They learned responsibility and now hold good jobs that they enjoy. These are great suggestions! My daughter who is two is Ms. Independent and she loves "helping" and doing things by herself. Fabulous suggestions and a great, creative hub! Hi, Eiddwen, thanks again, anything to keep the children happy, and its great to see kids doing DIY, they love it! What a brilliant hub Nell. Your obvious hard work always pays off!! Hi, Nell. How are you? I hope you always fine. Wow...I found some wonderful tips from you here. 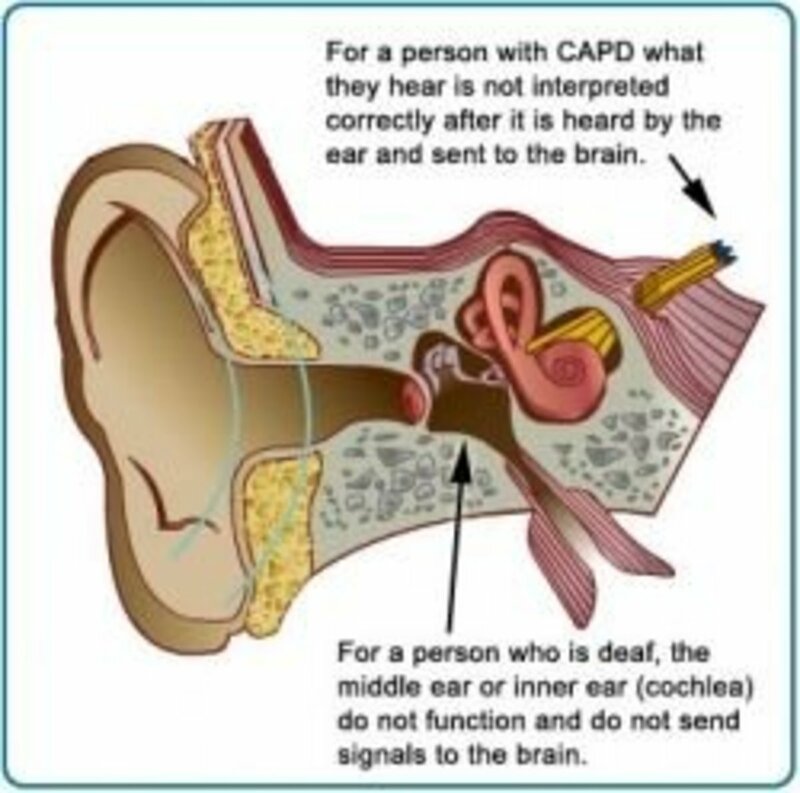 I believe many parents will love reading this information. Well done, my friend. Rated up! 'great and wonderful tips. Children love to be involved. All this brought back memories. Excellent, practical ideas! Really good training for the future, and also quality family time now! Voted UP and USEFUL! Having kids help paint walls is scary to me. I see paint cans knocked over and messy, blobby walls in my mindseye. 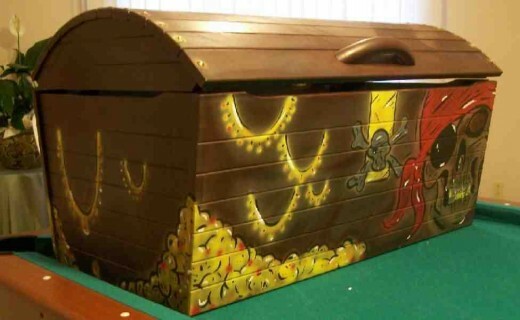 However, I love the other ideas like decorating a toybox or a small inexpensive piece of furniture. The draft stopper animal is a fun idea I never thought of, also. Doing crafts with kids is great fun for them and me! It's a great idea Nell, and it might even help the children to discover talents for things that they can use in the future. Fantastic Hub, Ms. Nell, and I loved the pictures. I don't suppose you know where I could rent a herd of kids to help with all my DIY projects, do you? ;) Voted up and useful! I just did a hub on cooking with children. I never thought about doing what you have done in this hub. This is also a great idea. Parents will help kids save money in the future because they will know how to do many home repairs, etc for themselves, rather than having to hire a contractor or other professional. Great Idea! These are some excellent ideas Nell! My littlest helped me to paint the primer coat on some cupboards I refinished the other day. He is so proud of himself for helping.